Even the Fed's revised forecast has now proven to be optimistic although there are still three months to go. 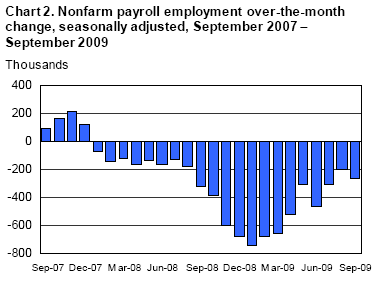 Nonfarm payroll employment continued to decline in September (-263,000), and the unemployment rate (9.8 percent) continued to trend up, the U.S. Bureau of Labor Statistics reported today. The largest job losses were in construction, manufacturing, retail trade, and government..
A total of 116,000 goods producing jobs were lost (higher paying jobs). It was nearly a clean sweep again this month with education and health services jobs contributing a mere 3,000 jobs to the plus side. The one cheery bit of news in the above numbers is the loss of 53,000 government jobs. Unfortunately, this trend is likely to reverse in a major way with as of yet unannounced son-of-stimulus and grandson-of-stimulus jobs packages. Work hours dropped .1 to 33.0. Short work weeks contribute to household problems. Moreover, before hiring begins at many places, work weeks will increase. Not sure what happened to the format of the following table but here are this months birth/death revisions. 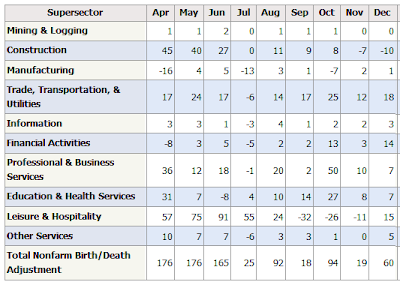 However, what does stand out this month is the loss of 33,000 Leisure and Hospitality Jobs. Think consumers are not cutting back on discretionary spending? 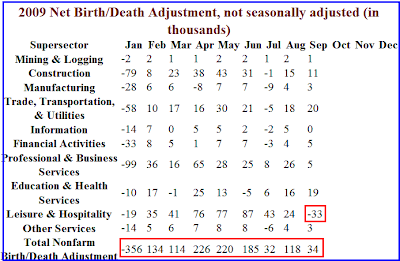 Please note that one cannot subtract or add birth death revisions to the reported totals and get a meaningful answer. One set of numbers is seasonally adjusted the other is not. In the black box the BLS combines the two coming out with a total. The Birth Death numbers influence the overall totals but the math is not as simple as it appears and the effect is nowhere near as big as it might logically appear at first glance. About 2.2 million persons were marginally attached to the labor force in September, an increase of 615,000 from a year earlier. (The data are not seasonally adjusted.) These individuals were not in the labor force, wanted and were available for work, and had looked for a job sometime in the prior 12 months. They were not counted as unemployed because they had not searched for work in the 4 weeks preceding the survey. In a typical recovery, the participation rate should go up not down. The reason is people hear there is a recovery, hear things are getting better, hear the talk about "green shoots" and think there might be a job if they go looking. Instead we see the participation rate drop by .3 and the civilian labor force drop by 571,00 workers. In normal condition, the civilian labor force ought to be growing by 120,000 a month due to increasing population and immigration. 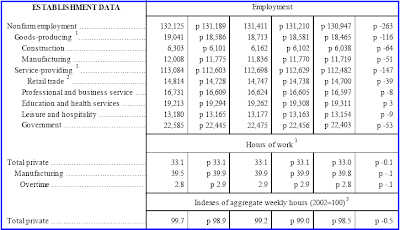 The chart shows there are 9.18 million people are working part time but want a full time job. A year ago the number was 6.3 million. This series has stabilized for the last 6 months. The key take-away from this series are the millions of workers whose hours will rise before companies start hiring more workers. The official unemployment rate is 9.8% and rising. However, if you start counting all the people that want a job but gave up, all the people with part-time jobs that want a full-time job, all the people who dropped off the unemployment rolls because their unemployment benefits ran out, etc., you get a closer picture of what the unemployment rate is. That number is in the last row labeled U-6. It reflects how unemployment feels to the average Joe on the street. U-6 is 17.0%. Both U-6 and U-3 (the so called "official" unemployment number) are poised to rise further although most likely at a slower pace than earlier this year. 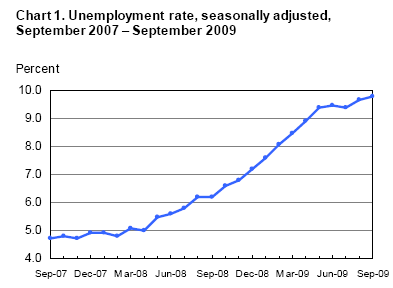 Unemployment is likely to continue rising until sometime in 2011.